There is a prolific children’s book creator who you will see referenced throughout the rest of our Mock Caldecott–Maurice Sendak. Arguably one of the best known children’s book creators of all time, multiple authors and illustrators have paid him tribute this year. His work, his studio space, and even a nib pen he used to own, will all come into play throughout the rest of our Mock Caldecott. This is not something the actual committee can discuss, but since we’re not the committee, let’s have some fun! The Fan Brothers were awarded the Sendak Fellowship in 2017 and began the major portion of the work for this book while working in Sendak’s studio space in New York. Though it is clear that this story is rooted in oral storytelling traditions as well as traditional fairy tales, in notable ways, Finn’s journey mirrors Max’s in Where the Wild Things Are. On what would have been his grandfather’s 90th birthday, Finn builds a boat to make the journey to the place his grandfather spoke of, “where ocean meets sky”. After falling asleep aboard the finished vessel, Finn wakes to find himself surrounded by open sea with an adventure waiting for him. The language in these spreads heavily draws on the rhythm of the pages where the world grows around Max, as well as the visuals of Max at sea. The details of the Fan Brothers’ graphite and digitally colored illustrations are stunning. We are introduced to Finn’s grandfather in a monochrome vignette, where he and Finn are looking at objects on a desk. The corresponding page shows the entire study space. These visual breadcrumbs become the road map to Finn’s journey, echoed in the things he encounters on his way to find his grandfather. 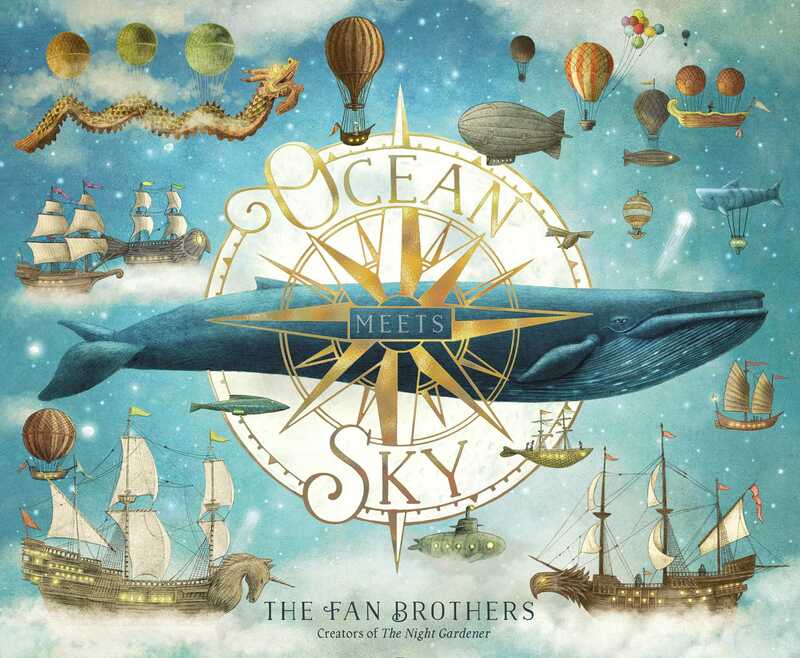 The bookish birds of the Library Islands, moon jellyfish, ‘the Gold Fish’, the giant sea shell islands, hot air balloons, the moon, ships, and whales are all pieces of this larger visual narrative to which we are introduced in the grandfather’s study. By the end of the story it is clear that Finn’s adventure is as much an exploration of grief as it is a journey to a place of remembrance. And, like Max before him, when Finn makes it home a hot meal is waiting. When I first picked up Ocean Meets Sky, I was immediately impressed by the feel of the book: the covers are heavy, the pages are thick with no border and full bleed illustrations throughout, there’s an incredible gold embossing underneath the dust jacket. It’s weighty, even before you read it. But now that I’ve taken this journey a few times, what really speaks to me is Finn’s growing understanding of what it means to remember those that we have loved. How we can bring those things they have taught us to the present while also saying goodbye. This is a tough lesson for kids, and the Fan Brothers’ approach is one that Sendak would have no doubt appreciated. What do you think? Is Ocean Meets Sky the most distinguished picture book of 2018? Let us know! Voting for ICPL’s Mock Caldecott runs through January 21st.